In continuation of the thought I started to develop in the previous text, this work suggests a relation between the focus of the exhibition - soviet propaganda critiquing racism in the US towards Africans and African-Americans - and racism in today's Russia towards migrants from post-Soviet territories. 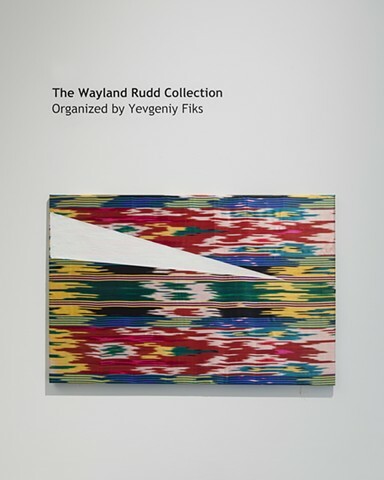 The work combines two visual elements - traditional Uzbek fabric is superimposed with the ray of light of Avrora, appropriated from one of the propaganda posters from Wayland Rudd collection. This points to multiple references, in addition to the central idea of the parallel in the nature of sensibilities towards race as represented by Soviets and as experiences in contemporary Russia. The further dimension of this work is referential to the market of art and to the status of abstraction. The visual element of the fabric ornament is non-figurative - purely abstract, as art of the modernist paradigm, which is the ultimate commodity of the art market today, abstract art that's being bought/sold in the West. On the other hand, it also represents a non-Western culture, and specifically refers to its crafts - notions opposing the Western art context. Also this emphasis on their craft implies the manual nature of the labor performed by migrants in Russia. The other part of the work - the triangular form of the ray - is also contradictory. Avrora symbolizing the revolution and the ray of light it produces, which showed the utopian path, are separated. The ray of light is displaced, so that it's not clear from where it appears and where it leads... Which can be seen also as the position of the oppressed migrants in Russia today. The literal act of displacement (of the fabric and of the poster element) itself also may refer to the social alienated status of the migrants. It can also be interesting to look at this geometric element in the context of the Russian avant-garde art, which is often considered to be the invention of abstraction. In addition to depicting a light, the triangle is reminiscent of the form often used in the constructivist propaganda posters - a speech bubble (attached). But in this case it's blankness alludes to the suppression of the voice of the migrants. Despite the utopian aspirations of the Russian avant-garde, similar to the supposedly idealistic sensibilities of the Soviet propaganda posters from the Wayland collection, today's status of abstract art as commodity demonstrates the failure of their project, like xenophobia in Russia shows the failure of the Soviet anti-racist propaganda. Alexey Katalkin was born in, Moscow, Soviet Union in 1975. For over ten years he was part of the collective, PG group, which in tandem with its artistic practice, was engaged in independent publishing and music. Katalkin has exhibited internationally at venues including the State Tretyakov Gallery, Moscow; Skharov Museum, Moscow; White Box Gallery, New York; Gallery Rabouan-Moussion, Paris; Brot Kunsthalle, Vienna; Garage Center, Moscow; Art Center Saint-Saveur, Lille; Art Laboratory, Berlin; and Masion Rouge, Paris. Katalkin participated in the Biennial of Seville, Spain, 2004. With PG Group, he received the Kandinsky Prize, 2008. Katalkin currently lives and works in New York.